So they have. 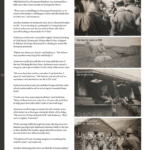 This collective account from 84 brave men and women whose interviews have been penned to paper and collected in one book, remind us that the “Greatest Generation” has many lessons from which to learn. 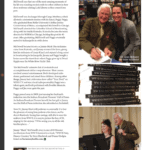 In February on a sunny Sunday afternoon at Indian Creek Elementary School, military-clad MPs stood at the entrance to direct traffic while those who stories have been told in this amazing book made their way to the gymnasium for the book’s celebratory launch. 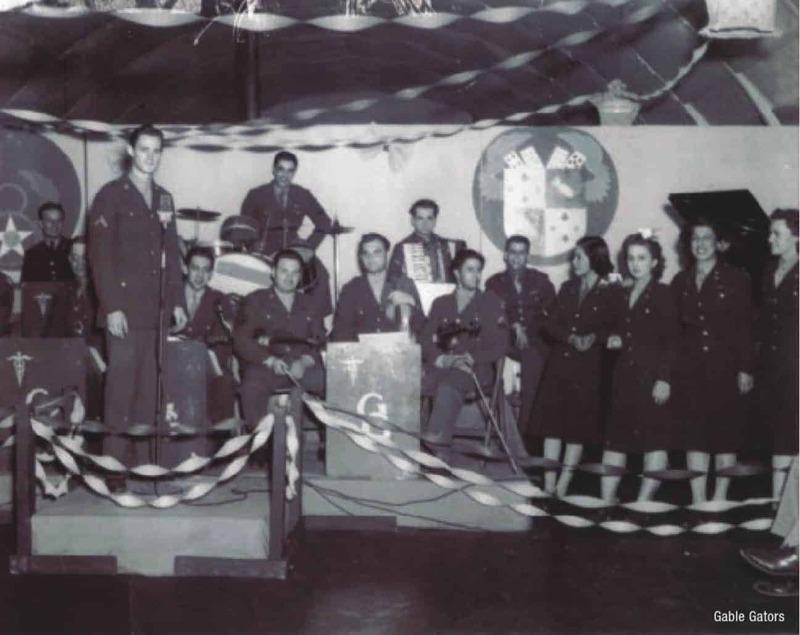 The gym was transformed to resemble a USO hall. 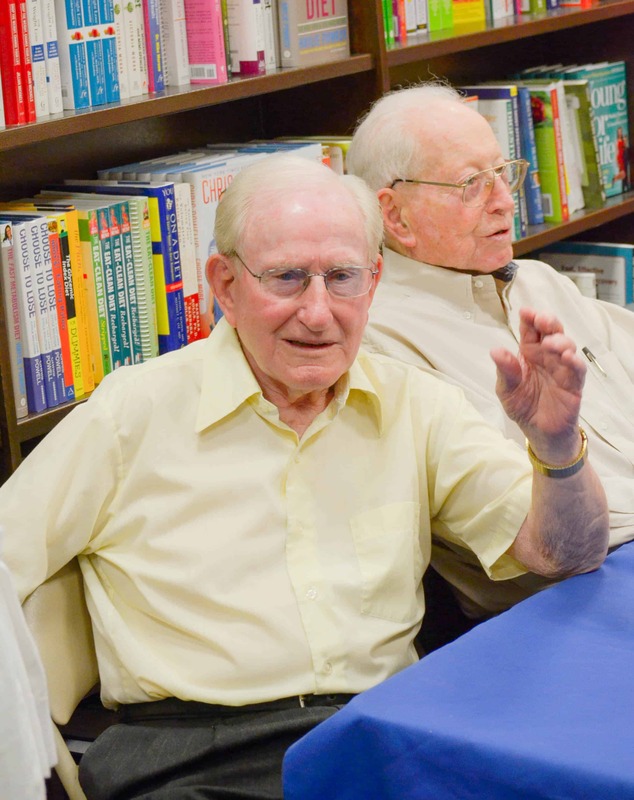 A standing-room only crowd gathered to honor these WWII Veterans and perhaps collect their signatures in a copy of the book. Hodgin and Hardwick were quite obvious in their intent of the celebration – it is all for the Veterans. 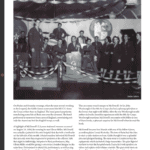 Even though they organized the stories and pieced together the book, It was not them seated ready to pen their name – only the Veterans. 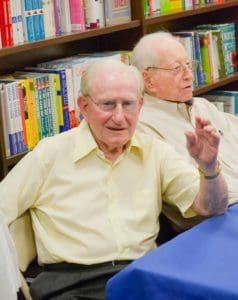 “It isn’t about me or Duane,” said Steve Hardwick, who did a wonderful Jack Benny impersonation, “It’s about these incredible men and women that the world owes a sincere debt of gratitude.” The book celebration included musical performances by former students of Steve Hardwick as well as by WWII Veteran Jim McDowell and Joy Conners (LCHS music teacher). 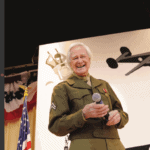 An additional honor was bestowed upon the WWII Veterans as Mr. Tom Applegate, former head of Veterans Affairs for Indiana, awarded each Veteran with a Distinguished Hoosier Award. The Distinguished Hoosier Award is one of the highest tributes given out by the State of Indiana to its citizens. It is solely granted at the discretion of the Governor to Hoosiers who have uniquely brought admiration and respect to the state through their character and accomplishments. No one could argue that there is not a more deserving group of recipients. For Hardwick, this all began for him while studying at Indiana State University in the fall of 1985 when he interviewed Terre Haute resident and Holocaust survivor, Eva Kor, for an assignment. 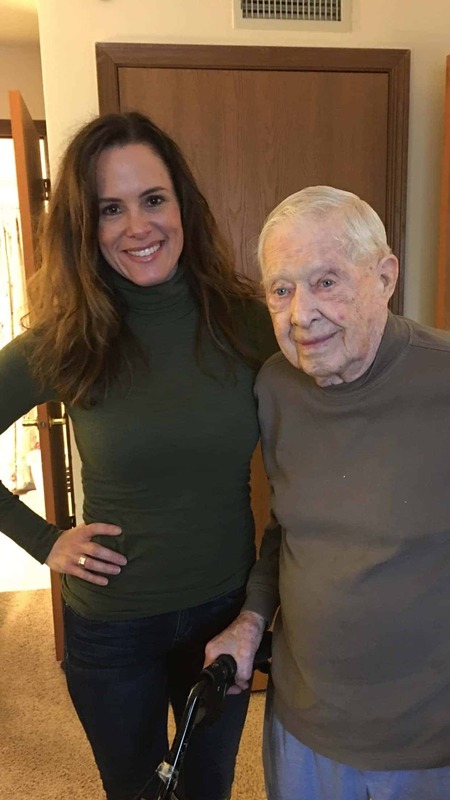 Two years earlier while Hardwick was serving in the military in West Germany, he had visited two concentration camps, which had an impact on him. Mrs. Kor asked Steve to volunteer for the CANDLES (her Holocaust museum in Terre Haute, www.candlesholocaustmuseum.org) inquest into the death of Dr. Josef Mengele, who performed inhumane experiments on prisoners at the Auschwitz death camp (Mrs. Kor and her twin sister were part of his “experiments”). After the inquest, Mrs. Kor asked the volunteers how they would use what they learned. Hardwick announced to the group that his hopes were to share the stories of the Holocaust survivors when he became a teacher. Forever inspired by Eva Kor’s miraculous story of survival and forgiveness, and that of WWII Veterans, Hardwick (teacher, Indian Creek Elementary – MSDLT) in his role of teacher, father, and now author, has dedicated much of his time to honoring those who served our country. 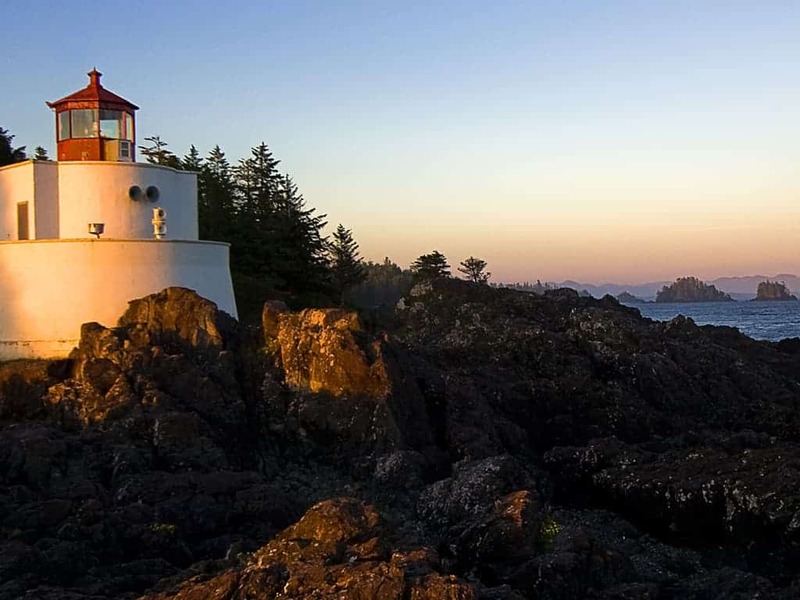 Co-Author Duane Hodgin’s involvement in writing this book was personally motivated as well, but for different reasons. 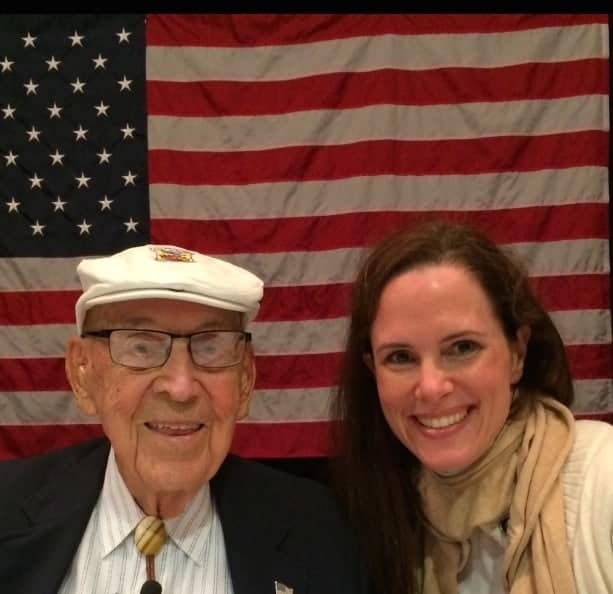 On July 13, 1944, while stationed in New Guinea, Everett Hodgin was serving his country during WWII. Back in Richmond, Indiana, his wife, Ellabell, gave birth to their son Duane. 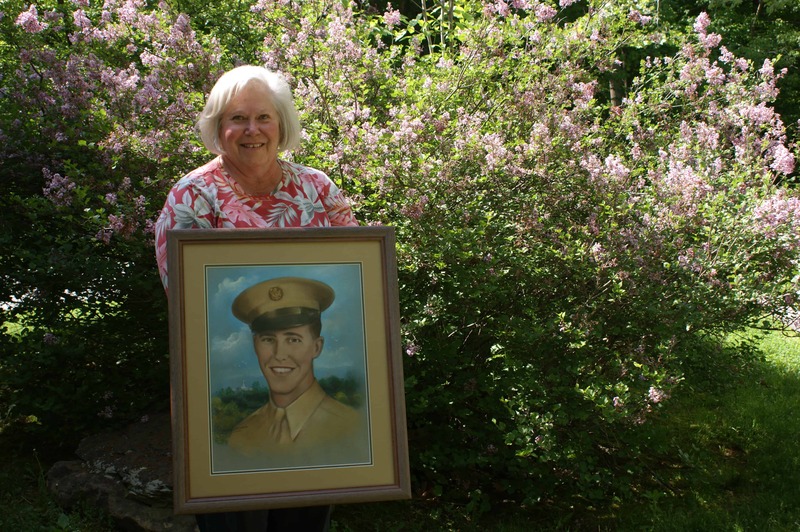 Like thousands of American servicemen, Everett was not present at the birth of his son. In May of 2004, Duane Hodgin took his father, Everett, to Steve Hardwick’s WWII Tribute put on by current and former students of Hardwick’s. 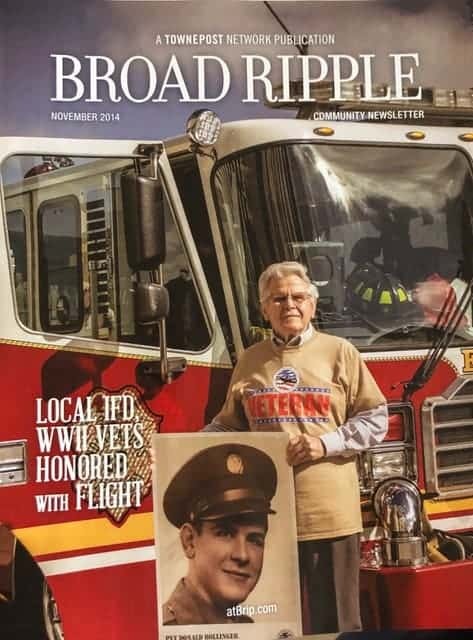 Upon retiring from Lawrence Township, Duane Hodgin suggested that he and Hardwick interview these Veterans and record their stories. The interviews began in January 2011, with Everett Hodgin being the first to interview. 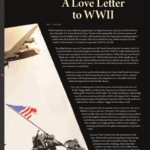 The related article “A Love Letter to WWII” originally appeared in Broad Ripple Community Newsletter May 2014. 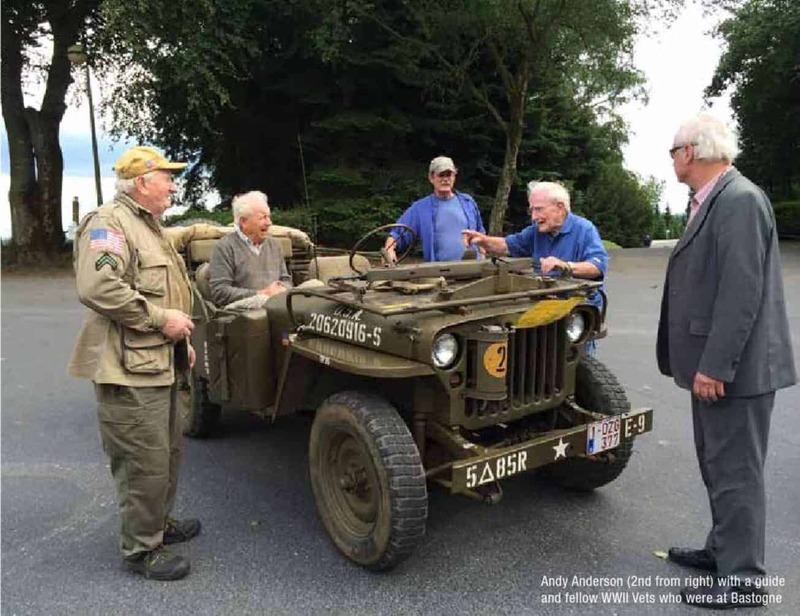 70 years after serving in Patton’s 3rd Army, US Army Medic Andy Anderson is taking a historic trip back to Germany to commemorate the 70th anniversary of the liberation of Buchenwald concentration camp. Before landing along the French coast, Anderson’s unit, the 94th Medical Gas Treatment Battalion, was stationed for 3.5 months in Pontypridd, Wales. “There were no buildings for housing in Pontypridd so we stayed with families. I still keep in touch with the family that boarded me,” shares Anderson. 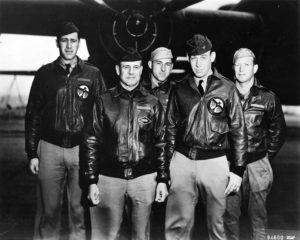 Anderson and his unit crossed the English Channel, landing at Utah Beach, Normandy, 10 days after D-Day. Assigned to Patton’s 3rd Army, they moved at a brisk pace across the European peninsula. 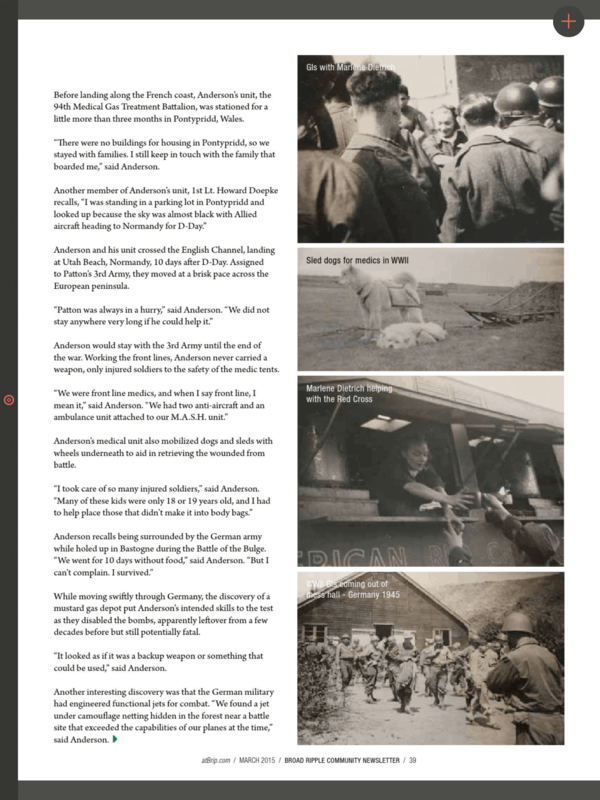 Anderson would stay with the 3rd Army until the end of the war. 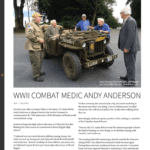 Working the front lines, Anderson never carried a weapon, only injured soldiers to the safety of the medic tents. Anderson’s medical unit also mobilized dogs and sleds with wheels underneath to aid in retrieving the wounded from battle. “I took care of so many injured soldiers,” says Anderson, “Many of these kids were only 18 or 19 years old and I had to help place those that didn’t make it into body bags.” Anderson was a young man, too, but he was one of the lucky ones to make it back home. 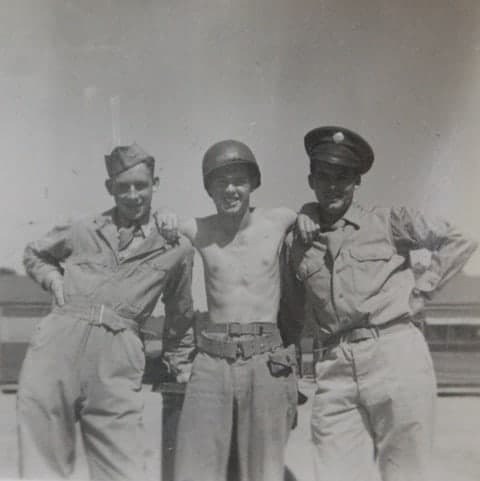 On April 11th, Anderson was part of the 3rd Army that liberated Buchanwald concentration camp, one of the largest. In contrast, while in Germany, Anderson met performer Marlene Dietrich. Dietrich, born in Germany, was outspoken against the Nazi party and feared for her family during the War. She immediately volunteered to entertain troops, starting in North Africa, before working her way to Germany to locate her family. “Doing what I did and seeing the things I saw was quite remarkable for a young man of my age,” shares Anderson of his WWII experiences. Once Anderson was sent back home, his unit prepared for the invasion of Japan, but the atomic bombs were dropped. “I was grateful for those bombs, as horrible as they were, they did save lives,” says Anderson. Andy Anderson began his high school education at Cathedral, but after flunking his latin course, he transferred to Broad Ripple High School. 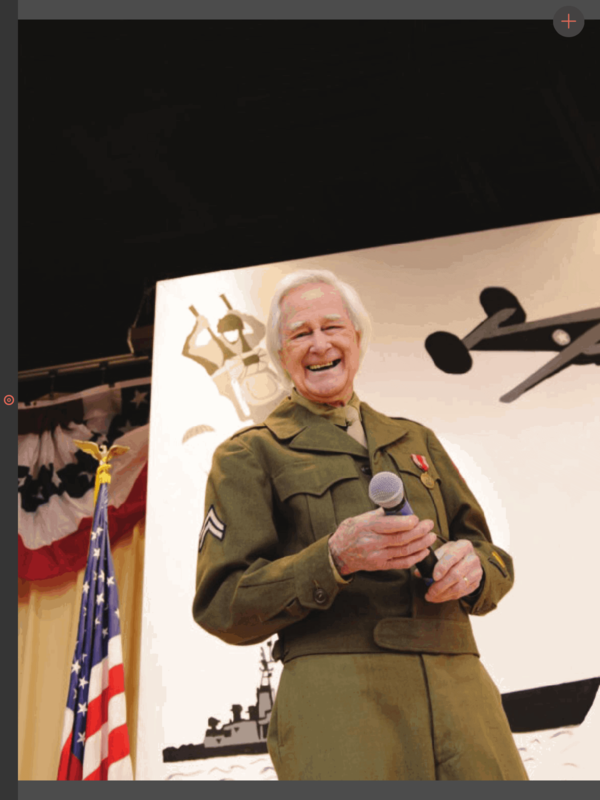 Having been drafted in December of 1941, Anderson missed his spring graduation ceremony. He received his diploma a couple years later in 1943, while dressed in uniform. “At the ceremony, the school made a big deal about me being in the Army and what I was doing. I was so embarrassed,” recalls Anderson, still turning pink in the cheeks. Interestingly, Anderson spent a portion of his training as a member of the Canadian Armed Forces. “You see, the US Army did not want the American people to know they kind of training we were doing, so we did this training with Canada,” shares Anderson. The training dealt with mustard gas, heavily used by the Germans during WWI. The Allied forces feared it would be used again. During these exercises, Anderson’s team was sent into a Canadian forest and were exposed directly to mustard gas. One unfortunate soldier did not have his mask on securely and died during training. “I still have the burn marks on my skin from the exposure.” shares Anderson. 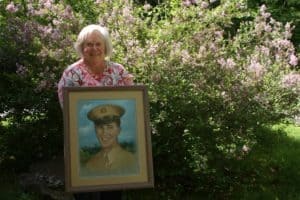 While moving swiftly through Germany, the discovery of a mustard gas depot put Anderson’s intended skills to the test as they disabled the bombs, apparently left over from a few decades before, but still potentially fatal. “It looked as if it was a back up or something that could be used,” says Anderson. Another interesting discovery was that the German military had engineered functional jets for combat. 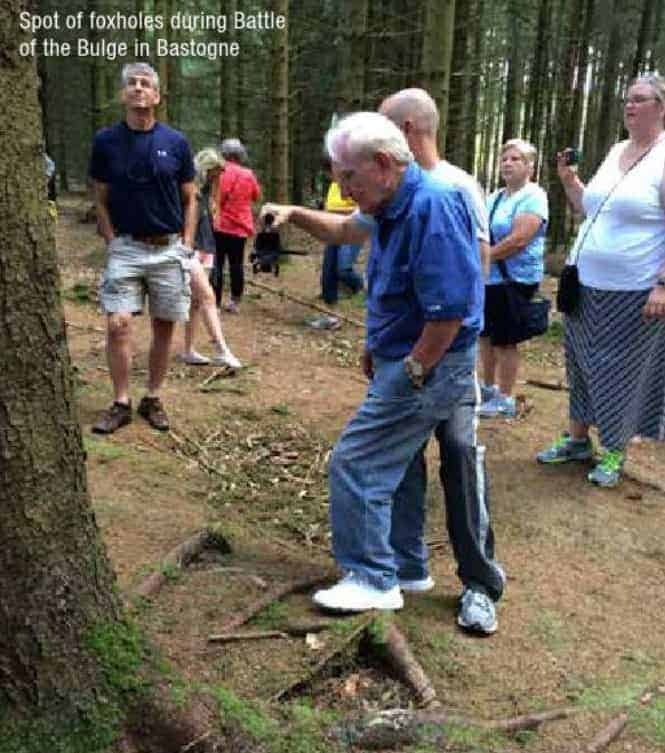 “We found a jet under camouflage netting hidden in the forest near a battle site that exceeded the capabilities of our planes at the time,” says Anderson. Now at age 92, Anderson is preparing to go back in April to visit Buchewald, to commemorate the 70th anniversary of its liberation. 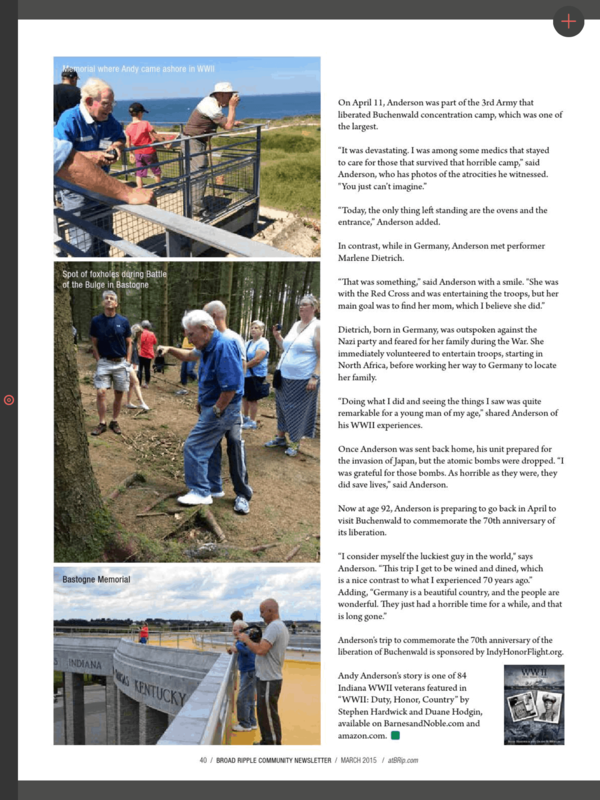 Anderson’s trip to commemorate the 70th anniversary of the liberation Buchenwald is sponsored by IndyHonorFlight.org. 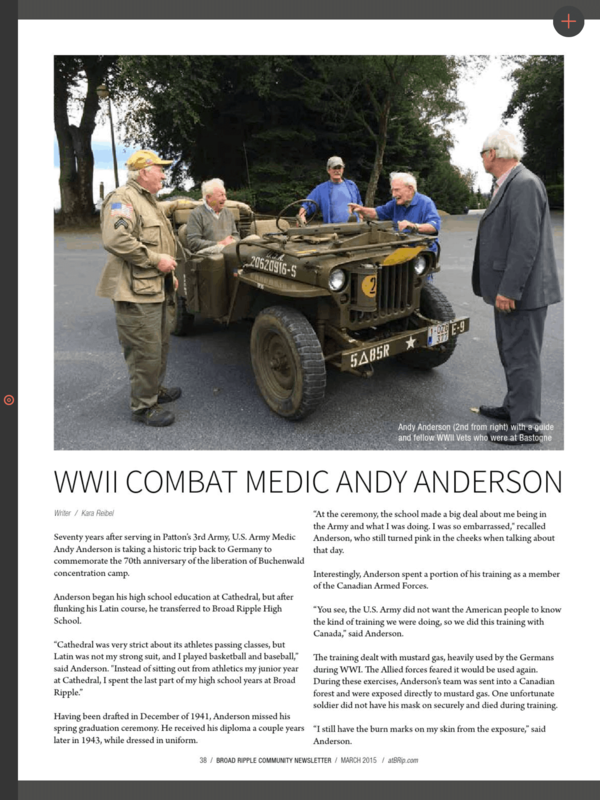 Andy Anderson’s story is one of 84 Indiana WWII veterans featured in WWII: Duty, Honor, Country, by Stephen Hardwick and Duane Hodgin, available on BarnesandNoble.com and amazon.com. 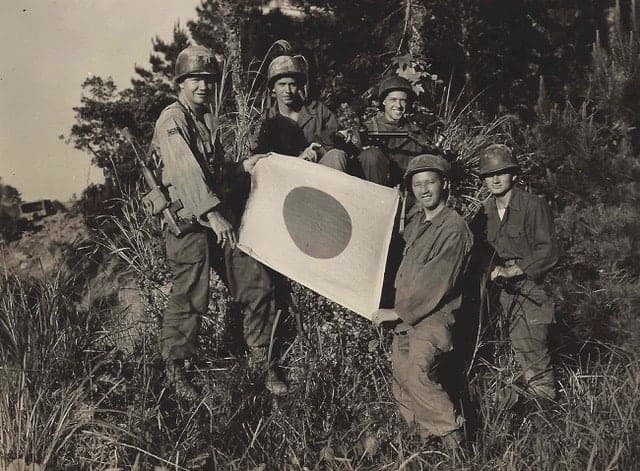 2015 marks the 70th anniversary of the end of WWII. This year is filled with anniversary milestones marking the end of fighting in Europe and in Asia, liberations of countless POW camps and concentration camps, celebrating the valor of those whose served and survived, and remembering those we lost. This year of historic anniversaries surrounding the final events of WWII is being celebrated by the American Battle Monuments Commission (ABMC) by canceling a long-held service honoring those who paid the absolute price for our freedom. 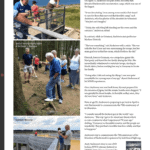 It is a simple effort that the ABMC is throwing out of their budget, but to thousands of families, this small effort is a major loss and disrespectful to the memories of the heroes buried overseas. The service that is squeezed out of the budget is the simple laying of flowers at the gravesite of our WWII heroes, along with a photo that is taken of the grave and emailed to the family member. The flowers are paid for by the families, not by the government. There were over 200,000 children in the United States that were orphaned by WWII. Many now members of AWON, American WWII Orphans Network. This simple act of respect performed on behalf of the families that cannot travel to Normandy (Normandy is one of many battlefield cemeteries) on a regular basis to visit their father or grandfather’s grave in person, have had the availability of a US serviceman or woman, who is already serving overseas, to lay the flowers on their behalf. Thanks to this budget cut, the families must now rely on a local florist to do this, taking away the reverence and respect of having one of our own honoring our fallen. This lack of respect, lack of understanding, and lack of just about any decency I can imagine shown by the removal of this service is astounding to me. Who made this decision? Why weren’t the families included in the decision? Perhaps they could have paid an additional fee on top of the floral fee to keep this service going? Who was involved in this budget cut? The answer: someone who doesn’t understand why we fought, who we fought, and what price was paid. When was it ok to stop honoring our fallen heroes? Thanks to Emily Longnecker with WTHR13 for doing a piece on this important topic. She was the FIRST media to address this with the ABMC. No other news organization has touched it…yet.